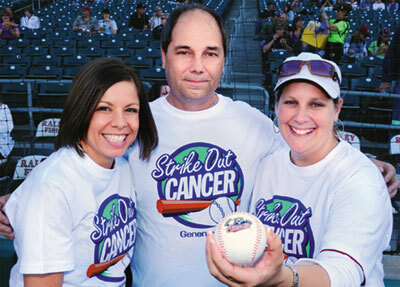 NorthBay Cancer Center patients (left to right) Amy Rodoni, Jeff Grossen and Donna Quintero were feted as part of Genentech’s Strike Out Cancer event, hosted by the Sacramento River Cats. Baseball fans love it when pitchers throw strikes, and now NorthBay Cancer Center patients appreciate strikes even more, especially when those “Ks” were thrown at Sacramento River Cats home games. The River Cats teamed up with Genentech-Vacaville, a member of the Roche family, to create a fund-raising event to benefit NorthBay Cancer Center and its patients. 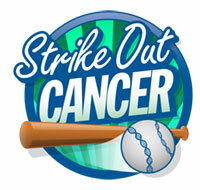 As part of its Strike Out Cancer campaign, Genentech agreed to donate $100 to the Cancer Center for every strike out thrown at a River Cats home game. By season’s end in early September, the team—the Triple-A affiliate of the Oakland A’s—had thrown enough strike outs to raise the donation past the $50,000 mark. Genentech employees also raised additional funds for the Cancer Center when they held two separate raffles that collected more than $4,000. The Vacaville employees also accumulated several bins of clothing and donated them to the NorthBay Guild Thrift Shop. NorthBay Healthcare Foundation Board Member Stanley Davis vowed to join in the K-parade, when he promised to match every strike out thrown at the Strike Out Cancer kick-off event, which was held June 11. The ’Cats threw nine strike outs that day, and so Davis added $900 to the pot.